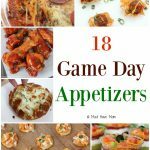 Big Game Football Party Ideas + EASY Football Party Appetizers! *Thank you Farm Rich for sponsoring this post. All thoughts are my own. 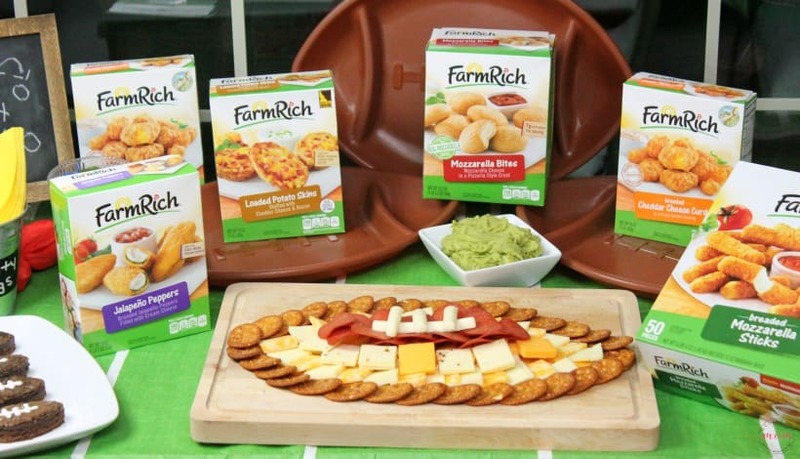 Visit your local grocery store to pick up Farm Rich snacks for game day and be the #HomegatingHero! The Big Game is coming and we will be throwing a big party to celebrate with friends and family! Ready to party for the Big Game? 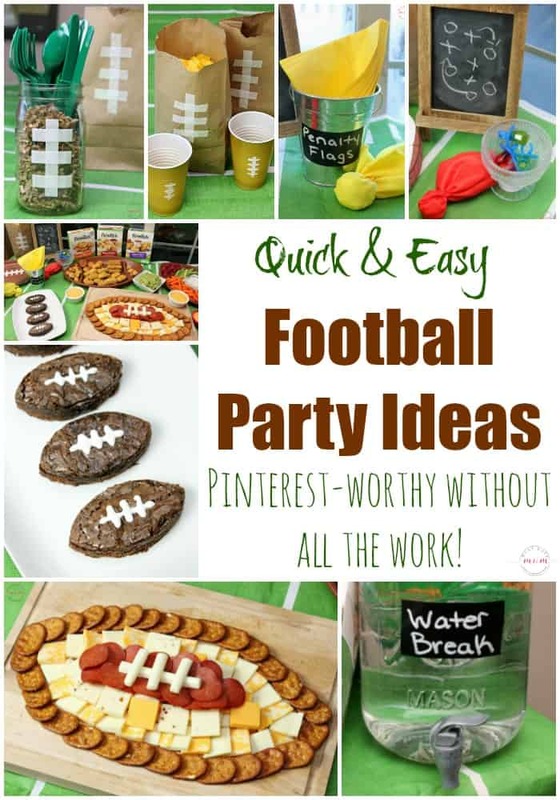 I’ve got all the pinterest-worthy football party ideas you’ll need WITHOUT all the crazy work! 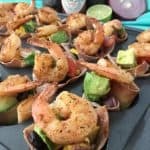 These are EASY and I’ve also got all the EASY football party appetizers you’ll need to please the crowd. Let’s throw the ultimate “homegating” party, because who needs to tailgate when you can homegate? I love throwing parties with themed food and decor, but sometimes the work involved in creating those parties is just plain daunting. Want to throw the best party on the block, worthy of pinterest and have all your friends talking about your amazing football party ideas, but don’t want to go crazy doing it? Then, this is for YOU! Easy, quick ideas that look like you spent all day putting it together! I’ll show you how to do it all. 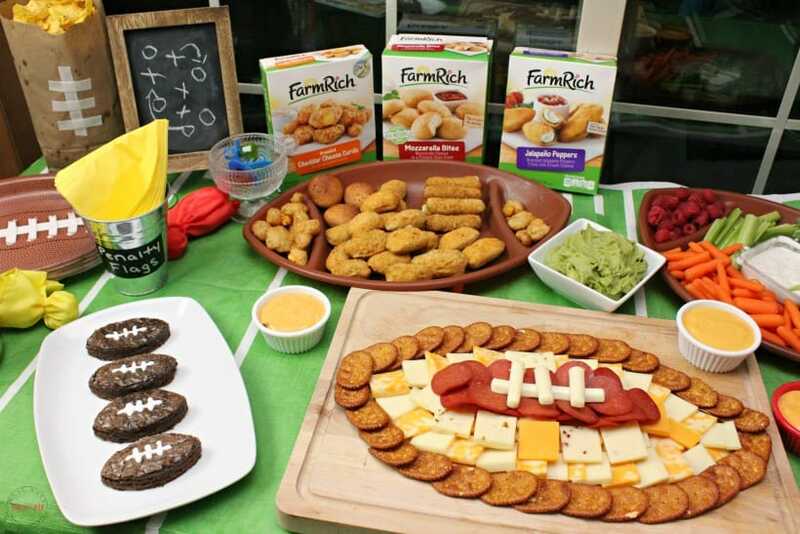 To truly throw the ultimate football party you’ll need a combination of great football party appetizers, football party decor and friends. I’ll show you how to execute it! I picked up an inexpensive football party tablecloth, plates and cutlery. I also grabbed some yellow napkins and used my tin pails I keep on hand with a chalkboard sticker that said “penalty flags” to create a nice tablescape that was easy and functional. 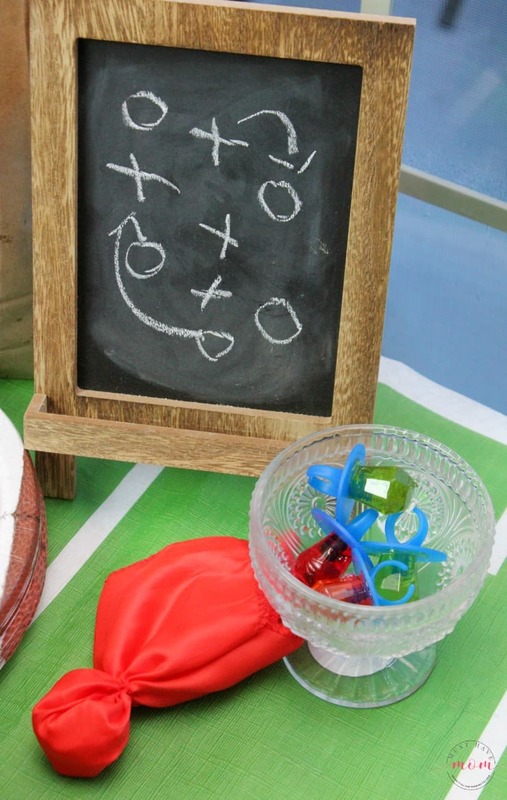 I then created easy tablescape decor by using a mini chalkboard with a football play on it (which my husband says is all wrong so you may want to get some input from someone who understands football plays better than I do haha). 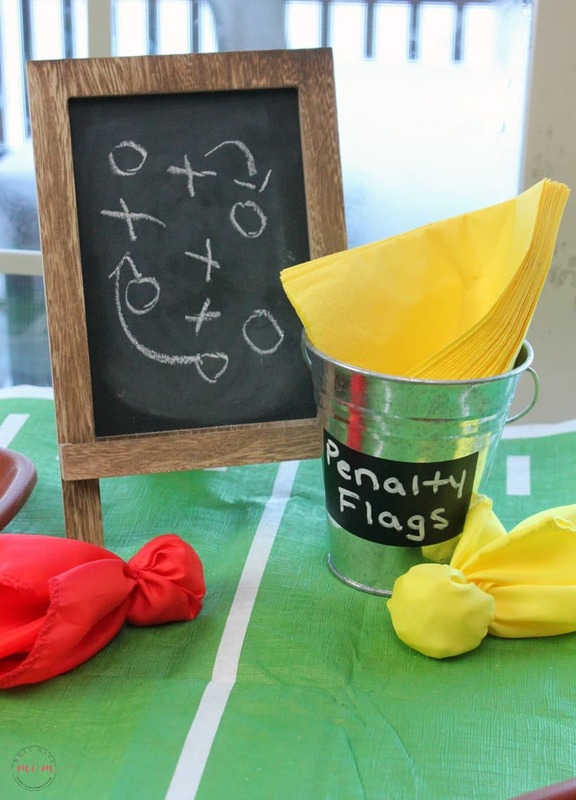 Add some penalty flags to the table to complete the look. 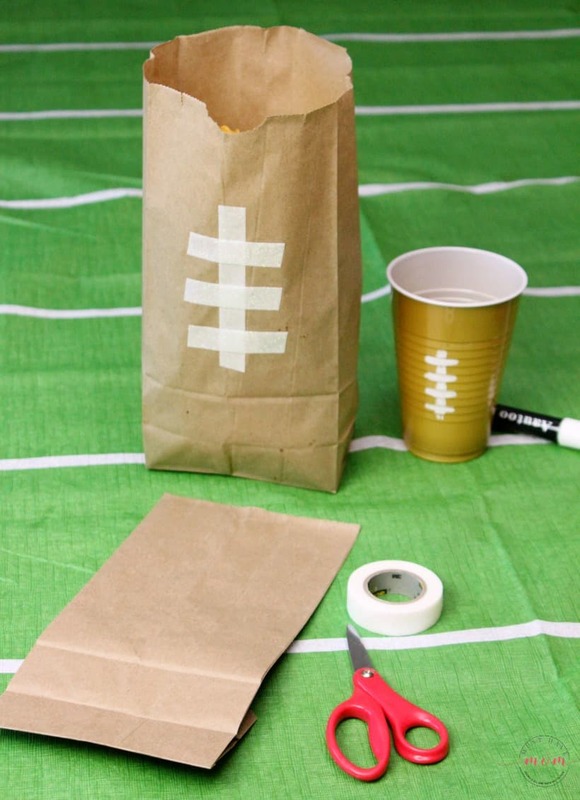 Next, I used brown paper lunch bags and white washi tape to make football-themed chip bags (these work great for popcorn too!). 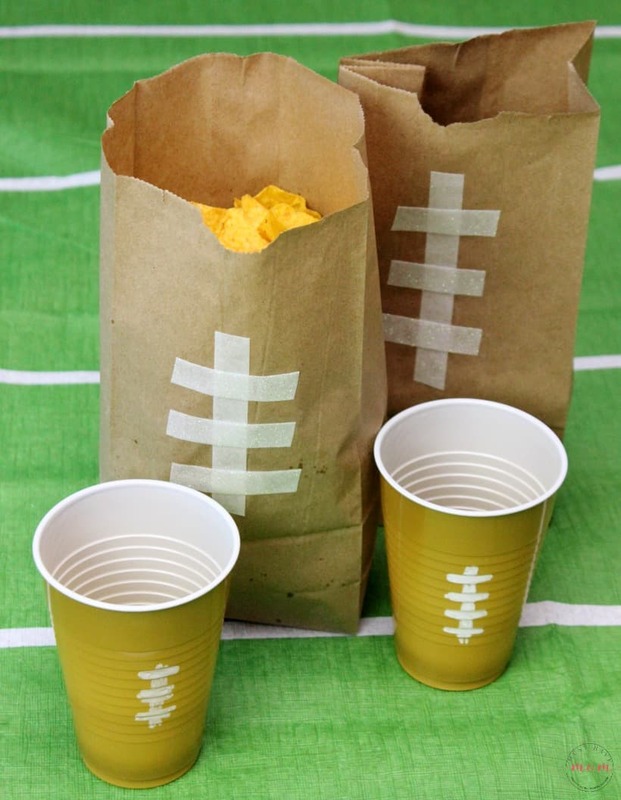 Just tape on the washi tape in a football laces pattern and fill each bag with snacks like chips, popcorn and pretzels! Grab some gold plastic cups and a white chalk marker to draw laces on each of your cups. Now you’ve got football-themed cups too! See how easy this is?! 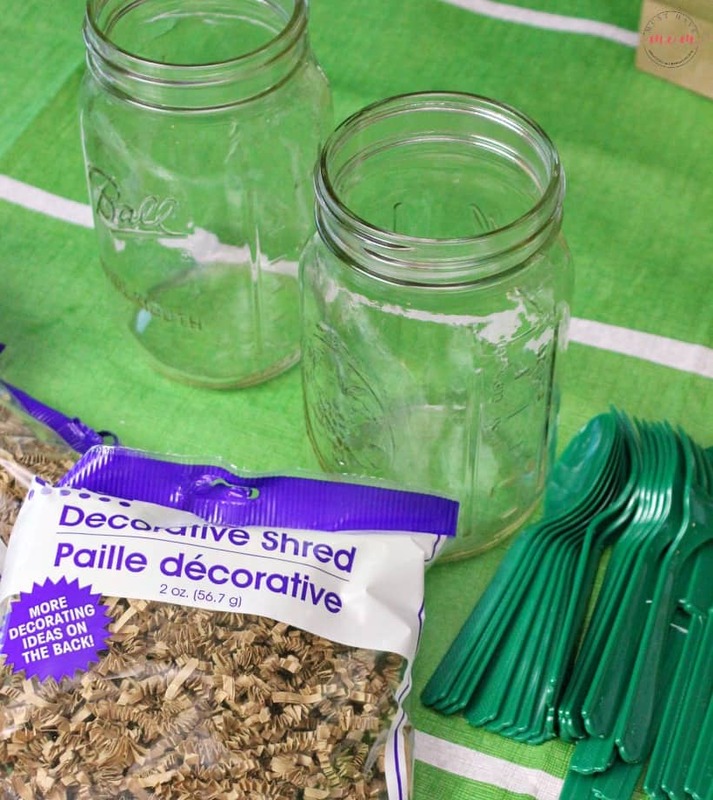 It literally takes just a few minutes for each football party decor project. 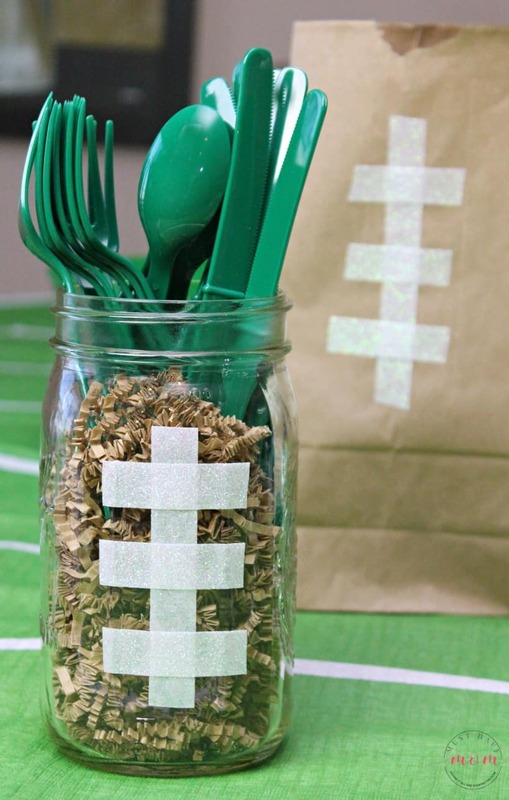 Finally, I used quart size mason jars, shredded brown paper and green plastic cutlery to make football silverware mason jars. 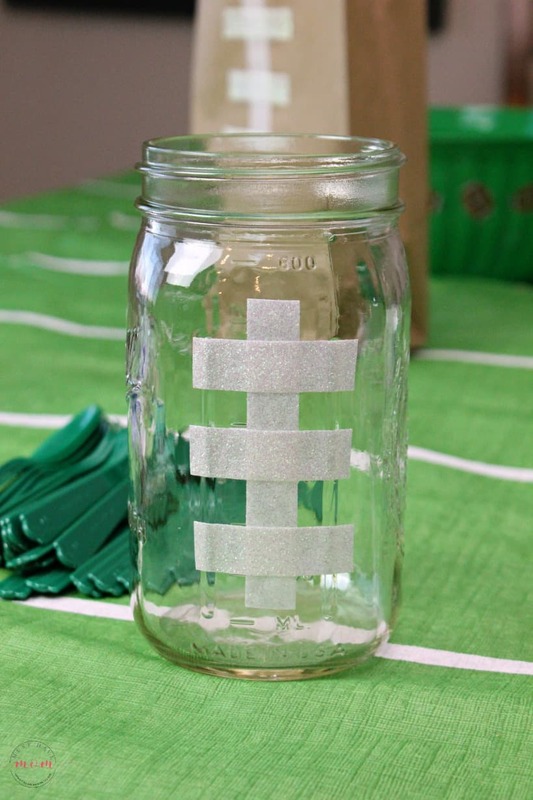 First, use washi tape to make football laces on the mason jar. Then fill it with paper shreds and add your plastic cutlery. Easy peasy! 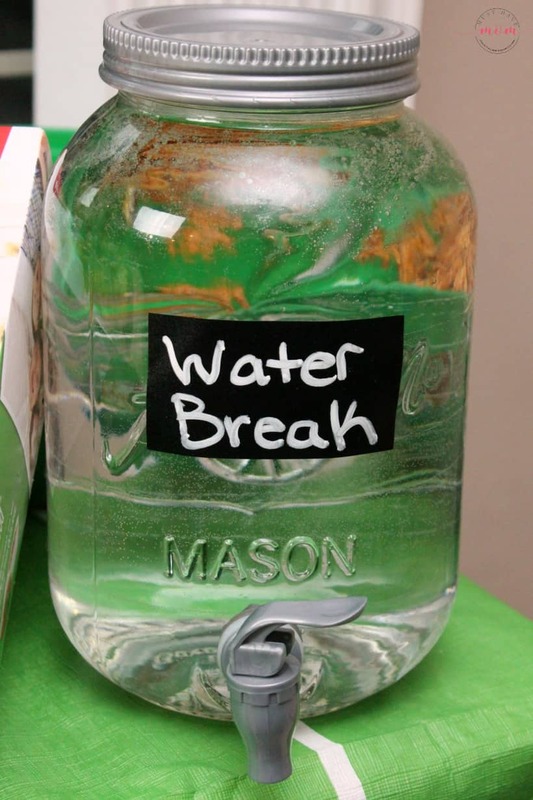 We kept our drinks simple with a “water break” dispenser. We also added some big game rings to our table which the kids loved. For dessert, I kept things simple and made boxed brownies and used a football cookie cutter to cut them in the shape of footballs. Then use storebought cookie icing to make the laces on each brownie. In keeping with my theme, I kept the food simple and chose all of our favorite Farm Rich appetizers for our party. They truly make the best appetizers (their mozzarella sticks are our family’s favorite and the ONLY kind I will buy). Keep it simple and set up your table ahead of time and have the Farm Rich appetizers ready to go. We cooked them at the beginning of the party and continued to snack on them throughout the whole game. These quick and convenient solutions will keep you out of the kitchen, so you can enjoy the game alongside your guests. 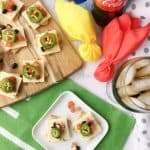 When you put all the foot and decor together it creates a stunning, pinterest-worthy football party that only took you a short time to throw together! 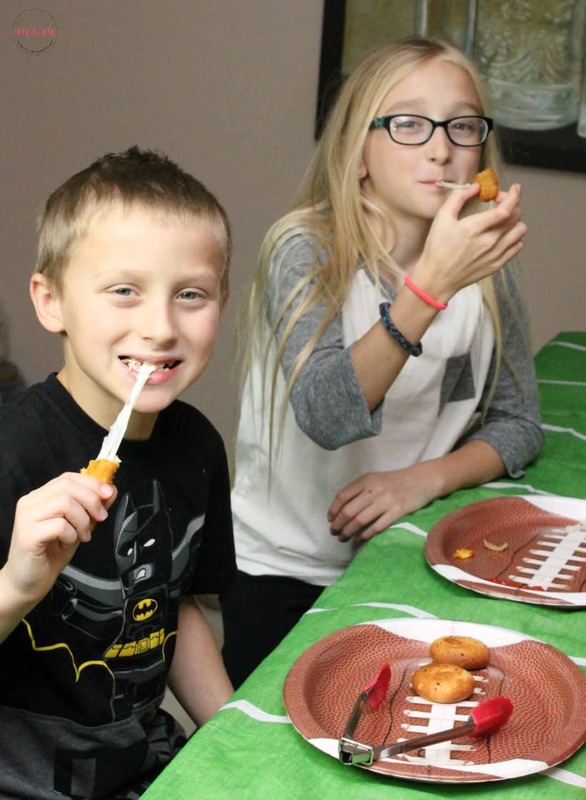 You can even enlist the kids to help get this football party ready! We served Farm Rich Mozzarella Sticks, Mozzarella Bites, Loaded Potato Skins, Jalapeño Peppers, and Cheddar Cheese Curds. 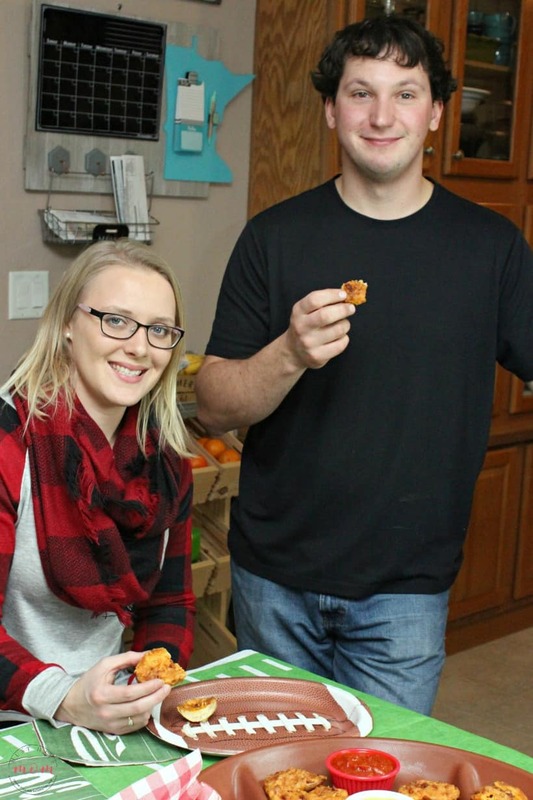 Farm Rich Mozzarella Bites are made with 100% real mozzarella cheese and serve as a good source of calcium and protein with 0g trans fat per serving, and my kids LOVE them! 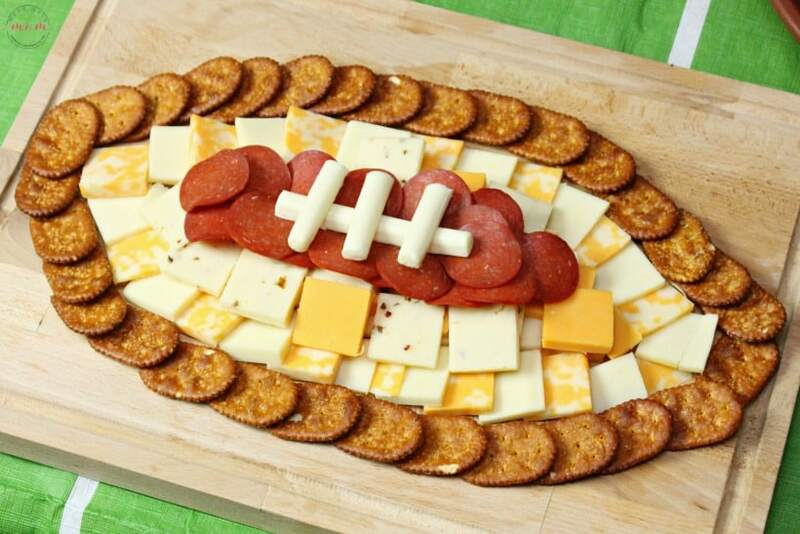 I also put together an easy football shaped cheese and cracker tray. I arranged the crackers in a football shape and then filled in the center with cheese slices, pepperoni and string cheese cut to look like football laces. It took me 5 minutes to cut the cheese and put this together. So easy! I also had a fruit and veggie tray on the table. It made for a well-rounded spread of party food! The final ingredient is friends and family! I didn’t snap nearly enough photos of our family and friends because I was too busy ENJOYING the party which is exactly what this post is about! How to throw the ultimate pinterest-worthy party in a short amount of time and still be able to enjoy the party itself! Be sure to have plenty of comfy chairs for your guests to watch the big game from! After all the good eats you’ll be ready to relax and curl up to watch the game! You can find our favorite Farm Rich appetizers at grocery stores across the U.S. Farm Rich products offer quick solutions for snacks, appetizers and meals that families can feel good about serving, including America’s favorite Mozzarella Sticks, Loaded Potato Skins, Cheddar Cheese Curds and more. 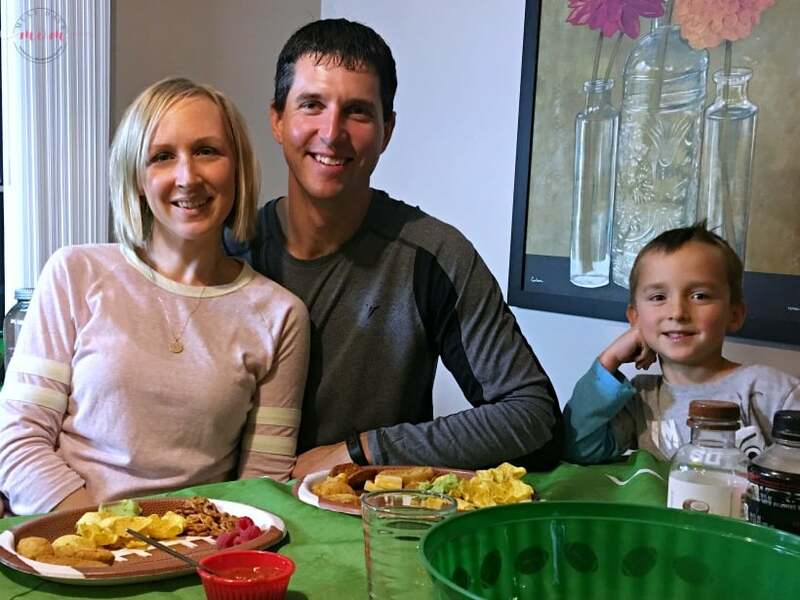 Today’s busy families have enough to deal with trying to get through the day, so Farm Rich helps make snack and mealtime easier and more fun! Find them in the freezer aisle. 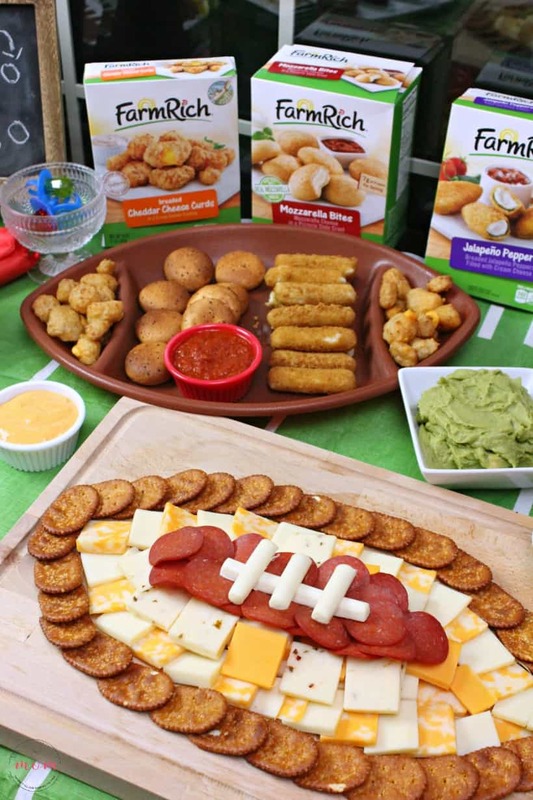 Find more easy homegating football party ideas here! 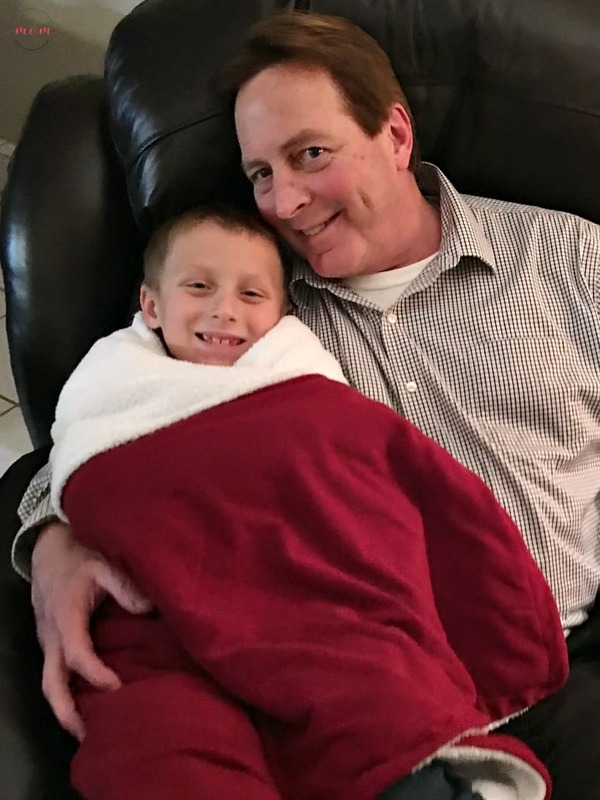 Game Day Traditions Worth Starting! « 5 Easy Financial Resolutions That Deliver Surprising Results! These are great ideas. I really love your football brownies. Farm Rich appetizers are our favorite! I still have 10 days to get ready for the game but I know it won’t be as well done as yours with those great decorations. 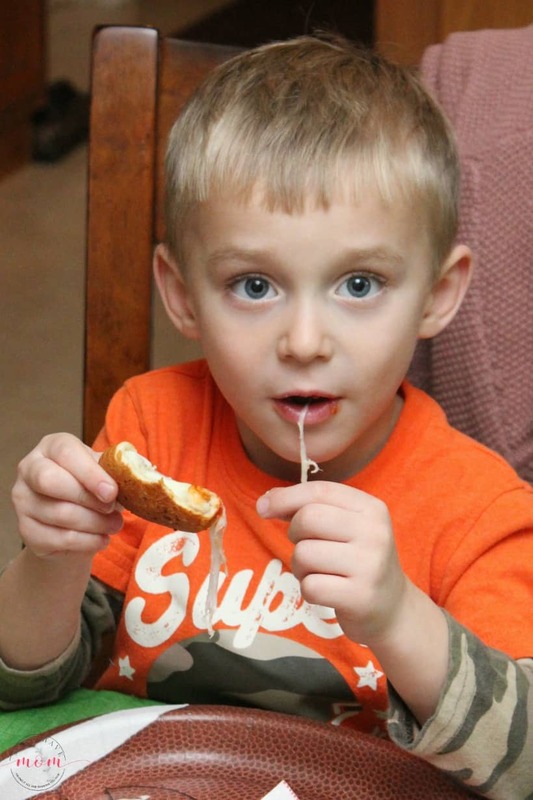 I know my son would love those mozzarella sticks with all those flavors. 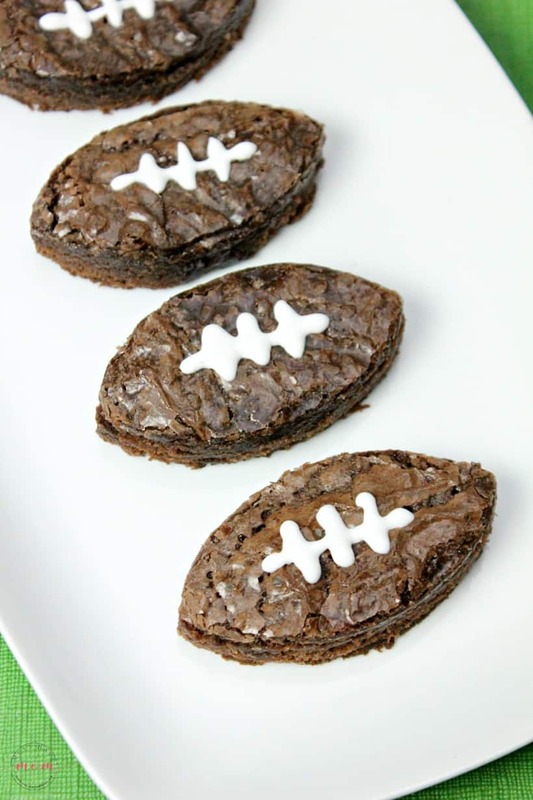 Those football-shaped brownies look so delicious. You got the shape down to a T! Super creative and super fitting with your theme. 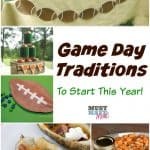 You have so many fun ideas going on with this football theme. 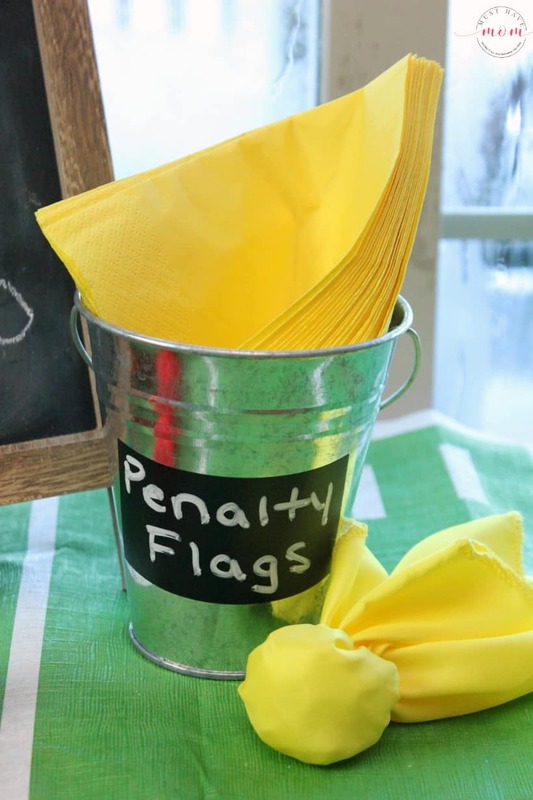 The “Penalty Flag ” napkins are so hilarious! The cheese and cracker platter are really cool as well. Awesome and creative ideas. Food looks delicious. 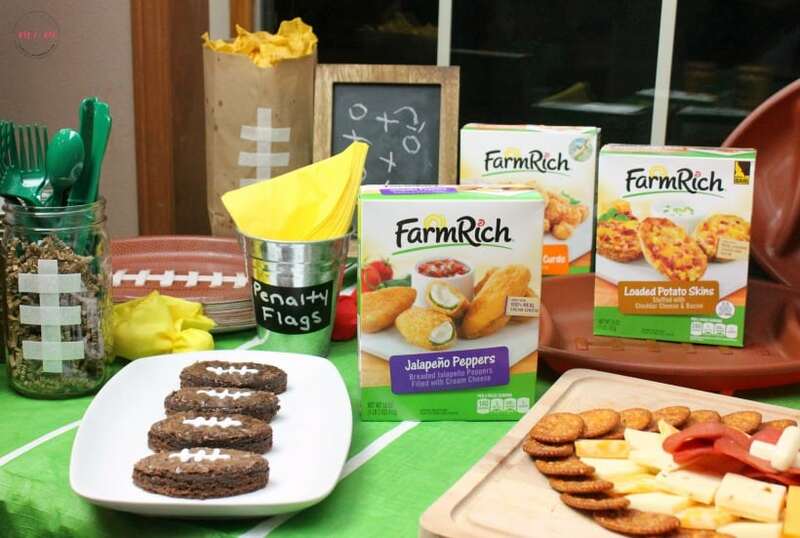 Farm Rich does have the best snacks for the big game! I love that you can easily prepare them and the various flavors/products are amazing!! 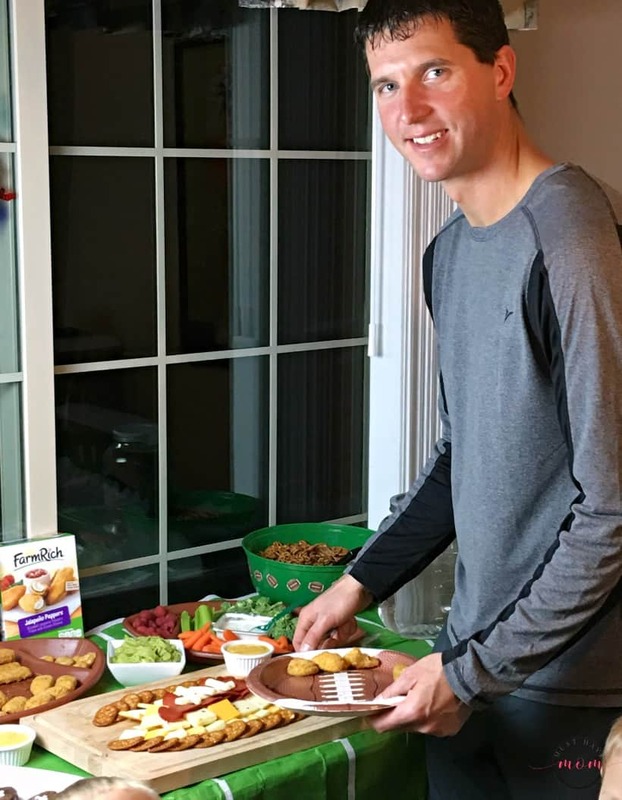 Appetizers for the big game are a must. You have so many great ideas here, for both food and decorations! Love all your ideas! Can’t wait to use some of them for our Super Bowl party! Your tablescape is the cutest! It turned out great and is perfect for game day! We love Farm Rich snacks and I always buy when for the kiddos – so easy to add to lunches and dinners, too when you’re in a time crunch!